I just heard the little vacuum turn on and was so excited that Chiquita actually took the Initiative and was starting her chores. . . I was mistaken! It looks like we have a new little, not quite 14 months old, helper for chore time! UNBELIEVABLE, ABSOLUTELY UNBELIEVABLE. 14 months going on ten years old ????? How adorable...and how smart! 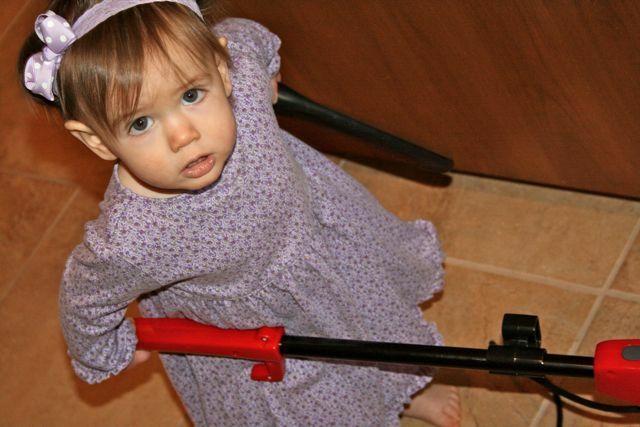 She handles that vacuum like a pro! So So cute! That was so cute! I have to laugh, because my 15 month old like to sort laundry and help me do little things around the house. Now to get the others motivated. so cute, such a big girl. She amazes me! She can turn on and operate a vacuum and we still can't put her in a forward facing car seat since she only weighs a whopping 18 pounds! :) Last week she figured out how to open the front door. . . I wonder what it will be next?! Omgsh, this is the cutest thing ever!!!!!!!! !